In this week's vlog, Kendall shares her story of why she decided to study abroad with CAPA in London, touching on the many benefits of spending a semester in this global city and why it may be a great fit for you. 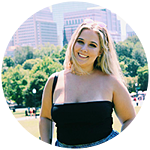 Kendall Hoyt is an official CAPA Instagram TV vlogger for Spring 2019, sharing her story in weekly posts on CAPA World. A communications major at the University of Massachusetts Amherst, she is studying abroad in London this semester. Kendall's journey continues all semester so stay tuned.